Add 1 heaped scoop(3g) to only 150ml - 200ml(8fl.oz.) of cold water or juice in a drink shaker. Mix and consume. Take 1 serve, 2-3 times a day. For Athletes: For optimum results, take 1 serve upon waking, 1 serve approx. 30 minutes before exercise, another serving straight after exercise and a serving before going to bed. If you’re looking for an effective way to boost your testosterone, you can’t go past this supplement! It’s so good you’d have to question whether or not It’s legal. Since taking it, my bodyfat has decreased and my muscle mass have gone thru the roof. If you too want your testosterone to peak, but without the undesirable estrogen rise, GEN HumanoVar is the supplement for you. I began taking GEN HumanoVar Growth Hormone booster just four weeks ago and I’ve got to say I’m very impressed with the results so far! I hadn’t heard of GH until recommended to me by a friend and it has really changed my workouts in a positive way. I’m able to lift a whole lot more than anything I could previously lift and I’ve found that on top of this I can also last a lot longer at the gym before becoming exhausted! This is the first GH supplement that I’ve tried so far, but I can recommend it to anyone looking to increase muscle and decrease body fat. I haven’t seen any of the bloating side effects associated with many other popular sports supplements such as creatine monohydrate, which is great. In fact, I have read that Growth Hormone actually improves metabolism, which is an added bonus to aid in fat loss! Gen Humanovar is a standardised extract (also known as Humanoforte) containing oligopeptide growth factors, essential amino acids & important nutrients. HumanoVar has traditionally been used as an evening supplement by power & strength trainers & may support exercise recovery. HumanoVar is available in both capsule and powder form. The capsule form allows discrete dosing, while the powder allows users to add HumanoVar to their favourite post workout beverage/shake. 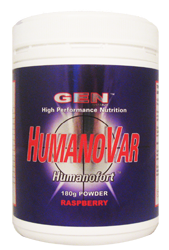 The powdered version of HumanoVar also comes with added branched-chain amino acids (BCAAs). The Humanofort High Performance Formula with BCAA is a high potency, muscle building and recovery supplement using the latest in instantised amino acid technology. The World's first Humanofort infused BCAA formula to help maintain an anti-catabolic state and provide muscle building and recovery potential beyond any other sports supplement devised. BCAA's (Branched Chain Amino Acids) are the essential amino acids, Leucine, Isoleucine and Valine. The combination of these amino acids makes up approximately 1/3 of skeletal muscle tissue in the human body. BCAA's play a very important role in protein synthesis (the production of proteins in cells from amino acids to build muscle). They are part of one of the genetic pathways which helps activate muscle repair and growth. The other genetic pathways are activated through the low molecular proteins ( short chain amino acids ) contained in Humanofort. When you combine BCAA's with Humanofort, you are providing the keys to unlock your muscle building potential. For a number of years, scientists have been urgently searching for a mechanism that would block the genetic proteins that inhibit muscle repair and growth. It may now appear that combining Humanofort with BCAA's could be the answer to that question. This can also be seen in our Mass Gainer, MP50. The Humanofort Formula with BCAA is ideal for any athlete. Whether you are a strength athlete like sprinters and rugby players or an endurance athlete like footballers and tri-athletes, the Humanofort Formula will help stop your body becoming catabolic after training or competition and help set up an enviroment where your body can recover at the optimum level. Optimising recovery is the key to help maximise muscle repair and growth which will lead to increased performances. The Humanofort High Performance Formula with BCAA has also a small amount of the amino acid, Alanine added to it. Supplementing Alanine, like Glutamine, plays an important role in regards to preventing the body going into a catabolic state. This is because when the body requires extra energy, Alanine is the first amino acid which gets transported out from the muscle to the liver to get converted into sugars to send back to the muscle to supply energy. You are therefore loosing muscle proteins and becoming catabolic. The BCAA's, then undergo conversion to replace lost Alanine in muscle which leads to interference in the recovery and muscle building process. Supplementing extra Alanine stops its release from muscle, helping to preserve BCAA levels and aid the recovery and muscle building process. To this date there have been no adverse effects ever been reported or observed from using Humanofort™. To establish proof that this could be done, a comprehensive scientific study was performed and Humanofort™ was given to laboratory rats and guinea pigs. As was expected, the research showed that the rats and guinea pigs significantly increased their steroidogenesis or steroid hormone production. The next test was for acute oral toxicity.. Acute oral toxicity tests are commonly performed by giving rats a test substance in a concentration many times stronger (per kilo of bodyweight) than a human would consume. The aim is to determine what effect this high dosage will have on the rats. Humanofort™ was tested for toxicity using a test called “LD50”. The name of this test stands for “Lethal Dose 50” where a substance is given to rats at 5,000 milligrams per kilogram of bodyweight to kill the rats; then the rats are autopsied and their organs evaluated for specific toxicity or cause of death. Humanofort™’s LD50 toxicity test was a surprise for everyone!. A report read; “The animals were observed for mortality, signs of gross toxicity, and behavioral changes during the first several hours post-dosing and at least once daily thereafter for 14 days. All animals survived, gained body weight, and appeared active and healthy during the study. There were no signs of gross toxicity, adverse pharmacologic effects, or abnormal behavior.” Average bodyweight of the mice went from 172 grams to 246 grams in 14 days. Dr. Gheorghe Mihaescu, M.D. is an international expert in such fields as Experimental Immunology in Oncology, Steroid Biochemistry, Radio-assay Methodologies, and Geriatric Nutrition. Dr. Mihaescu has authored 32 published scientific papers in the aforementioned fields. He also holds 15 invention patents, which have been recognized and prized by the European scientific community at the prestigious Brussels and Geneva Conventions.